Need Help - Damaged "Side Under Spoiler"
My workplace re-arranged our parking scenario last week and being the idiot I am, I mis-judged the curb I was parked next to and ended up denting my "Side Under Spoiler" a.k.a. 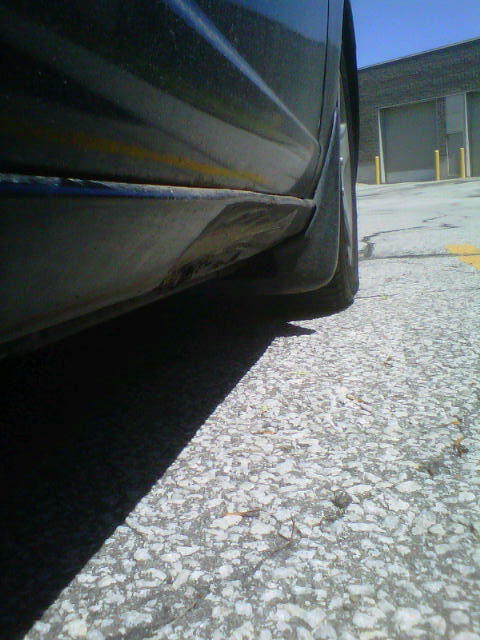 OEM Side Skirt, as well as the under body frame. 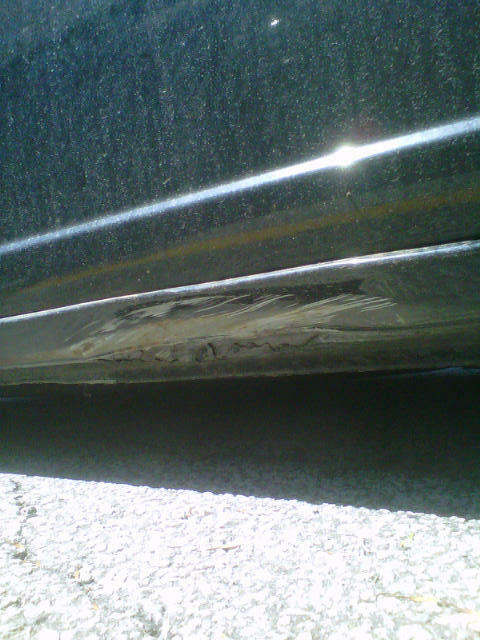 My only problem is, what should I do with the frame damage beneath the car? It's not affecting the floor structure, but I was told this can impact my brake lines/fuel lines. 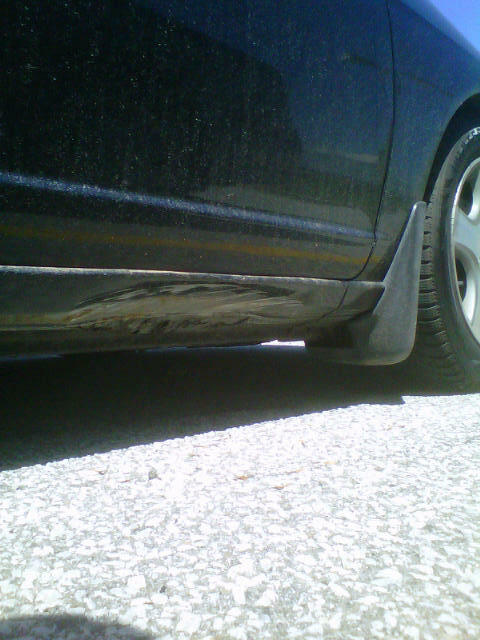 The car is a 2004 Honda Civic Coupe SI (EM) and the damage is on the passenger side. I'm starting to think this may be worse than I expected. Last edited by Mixed1; 28-Jun-2011 at 03:56 PM. Can you post a few pics so we can see the damage? I've uploaded as attachments, sorry for the low res images. Took em' on my BB and tried to keep the attachments small. 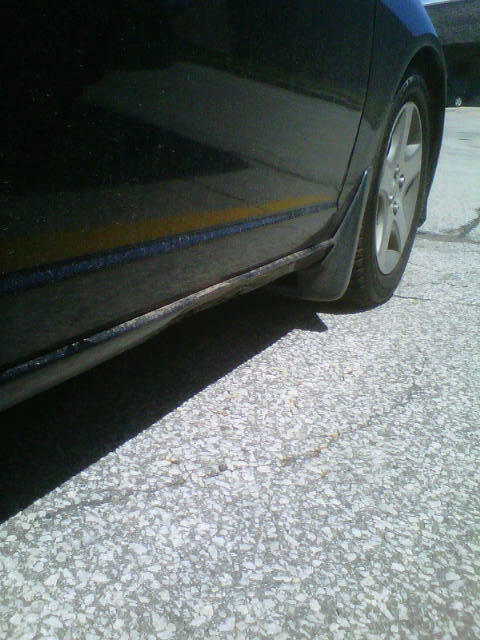 I added different angles to show the depth of the dent. Doesn't look nearly as bad as I pictured it...lol. A body shop could probably fix that and re-paint the area for pretty cheap. Drive around to a couple local body shopsa and get some quotes. Don't know how you'd fix that without using the body shop tricks of the trade. You'd need to get in behind that area to apply force and push it back out. I would say that's not structural damage at all though. Just cosmetic. I was more concerned about pinching my fuel line/brake line as a co-worker mentioned that they run along the sides under the shell. The cosmetic stuff can wait a bit I guess... but I want to get it done before winter as the scratches might breed rust. Do you think it will be easy enough to replace the lip? or will I have to bend some of the frame back first? the fuel & brake lines for your car run along the driverside, they definately didn't get touched... unless u drove over the curb..? If I were you I'd do just as MPR said, try going to a few body shops and get some quotes. IMO if you want the job done right, for a decent price go to Indy's 101 Customs and get them to deal with it.. they pay attention to detail and don't cut corners in repairs. I just kinda curb hopped the one side. The driver's side never touched anything so glad to know I'm safe. I'll give that shop a shout as well. Quick Reply: Need Help - Damaged "Side Under Spoiler"